Move over Loch Ness – it appears there’s a new monster on the block and this one has almost 550,000 Facebook views. 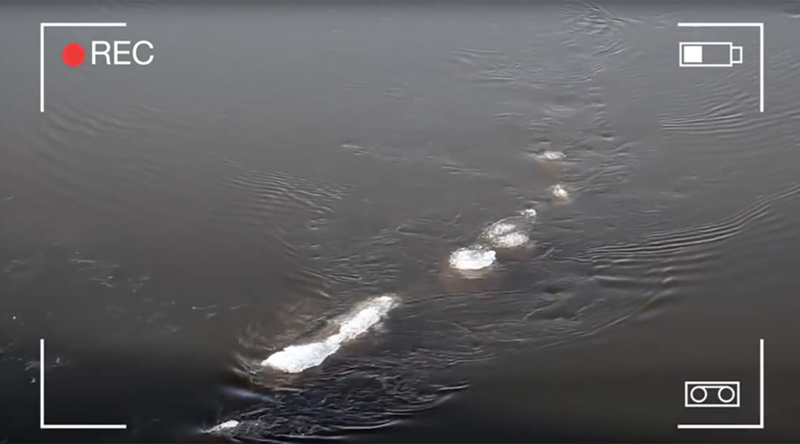 Extraordinary footage of what looks like a creepy aquatic creature was taken on October 18 at Alaska’s Chena River by Bureau of Land Management workers Craig McCaa and Ryan Delaney. According to McCaa, the serpent-shaped animal was about 12-15ft (3.5-4.5 meters) in length and snaked back and forth just beneath the surface for several minutes. The fact that there appeared to be a sheet of ice running along its back has only added to the intrigue. “It clearly has a tail swaying, the ice rotating with its swaying tail, a head is in front of it and you can make out a shape of a forehead in the water.also can see to the left of its head what looks like a fin. it is a HUGE fish,” one YouTube viewer said of the phenomenon. “Perhaps there are monsters frozen in the Ice that are defrosting... this one looks like it has a frosting cover!” said another. So whether ‘Nessie’ has fled Scotland in fear of what life will be like in a post-Brexit UK or this river monster is an Alaskan native, it appears to many that North America has a new mysterious beast to rank alongside Big Foot. Of course this isn’t the first time we’ve seen a mysterious aquatic creature outside Scotland. A ‘giant worm’ was filmed in a lake in Iceland in 2012. Unfortunately for believers, the Alaskan Bureau of Land Management posted to Facebook what it thinks was actually caught on camera – "frazil ice stuck to a rope that is probably caught on a bridge pier."